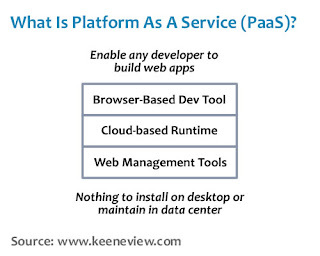 The Keene View on Cloud Computing: What Is Platform as a Service (PaaS)? There are a number of companies offering Platform as a Service (PaaS), but little agreement about what PaaS is or how to compare various PaaS offerings from companies ranging from SalesForce to WaveMaker. Even the Wikipedia entry on PaaS starts with a stern warning that the entry is full of buzzwords and lacking in concrete examples. PaaS solutions are development platforms for which the development tool itself is hosted in the cloud and accessed through a browser. With PaaS, developers can build web applications without installing any tools on their computer and then deploy those applications without any specialized systems administration skills. McKinsey & Company, in their 2008 report "Emerging Platform Wars," defined Platform as a service as "cloud based IDEs that not only incorporate traditional programming languages but include tools for mashup-based development." The alternative to PaaS is to develop web applications using desktop development tools like Eclipse or Microsoft Access, then manually deploy those applications to a cloud hosting provider such as Amazon EC2. Multi-tenant development tool: traditional development tools are single user - a cloud-based studio must support multiple users, each with multiple active projects. Multi-tenant deployment architecture: scalability is often not a concern of the initial development effort and is left instead for the sys admins to deal with when the project deploys. In PaaS, scalability of the application and data tiers must be built-in (e.g., load balancing, failover need to be basic elements of the dev platform itself). Integrated management: traditional development solution usually do not concern themselves with runtime monitoring , but in PaaS, the monitoring ability needs to be baked into the development platform. Integrated billing: PaaS offerings require mechanisms for billing based on usage that are unique to the SaaS world. Browser-based development studio - if you have to install something on your computer to develop applications, that's not PaaS! Seamless deployment to hosted runtime environment - ideally, a developer should be able to deploy a PaaS application with one click. If you have to talk to a person to get your app deployed, that's not PaaS! Management and monitoring tools - while cloud-based solutions are very cost effective, they can be tricky to manage and scale without good tools. If you have to bolt on DIY monitoring to scale your cloud app, that's not PaaS! Pay as you go billing - avoiding upfront costs has made PaaS popular. If you can't pay with your credit card based on usage, that's not PaaS! PaaS offers the potential for general developers to build web applications without needing specialized expertise. This allows an entire generation of MS Access, Lotus Notes and PowerBuilder developers to start building web applications without the huge learning curve. Other definitions for Paas are offered by Bungee, Salesforce and ZDNet. a very informative and succinct article. It really does put the power in the developer's hands. @ Peter, @ ahodges - yes, PaaS offers a great deal of power, but there are a number of barriers too, such as who owns the data and how the PaaS vendor can overcome security and business continuity concerns. In short, PaaS is very much a work in process! Good post. I agree with you on your checklist point 2-4. But I wouldn't include the first one. Actually you don't really do so too, because as your first example you mention Google App Engine which has no browser based IDE. A browser based IDE might be a good optional feature. I wouldn't force it on any developer though since I believe in the power of choice. 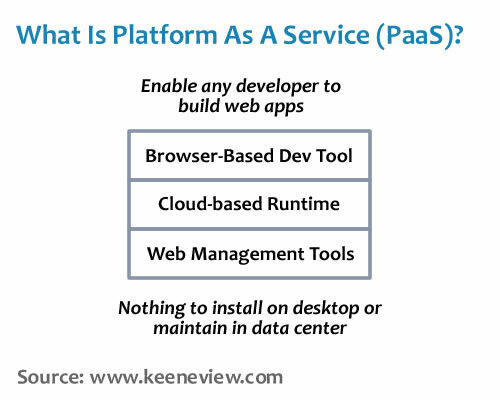 Because of that I wouldn't include it as a must have into the definition of PaaS. This post does a great job of summarizing PaaS, which is a tricky technology to describe. Many more providers have come onto the scene since this was originally posted in 2009, including Microsoft Azure and Mendix. Browser based tools and pay as you go billing. What more could any entrepreneur in the software development industry need? Personally, I don't like using any tool that I am compelled to download. I think there should be options. I like browser based products because I can use them form anywhere, on any device. If I start working on an application on one device, I can go somewhere and continue working when I have a free hour. Entrepreneurs want the ability to send and work with documents, or build applications from wherever they are and software like this allows them to do that.